Our nearest galactic neighbor is the Large Magellanic Cloud. But despite its close proximity — about 160,000 light-years — astronomers are still finding new features to explore, including this stunning supernova remnant that appears to be sitting right beside a stellar nursery. This image was taken by the ESO's Very Large Telescope. At the left is the remnant of a supernova explosion called SNR 0536-67.6. 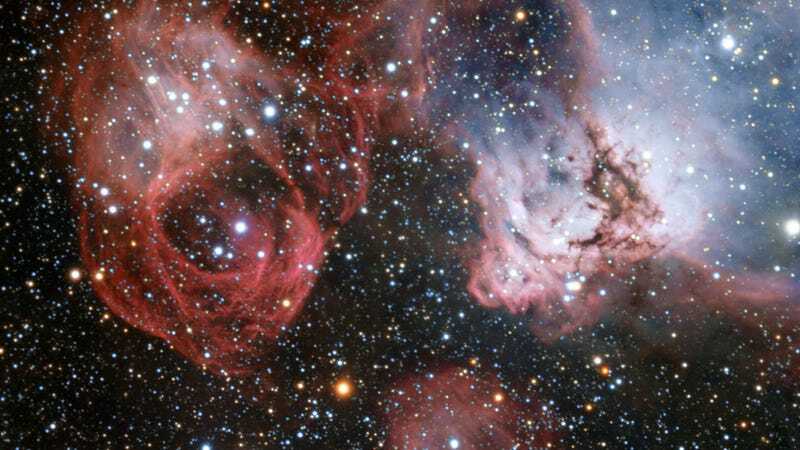 And at right is NGC 2035, an emission nebula consisting of clouds of gas that are glowing on account of the energetic radiation emitted by young stars. Thrown in the mix are dark clumps of dust that absorb rather than emit light, resulting in weaving lanes and dark shapes across the nebula. According to the ESO, these clouds are several hundred light-years across.